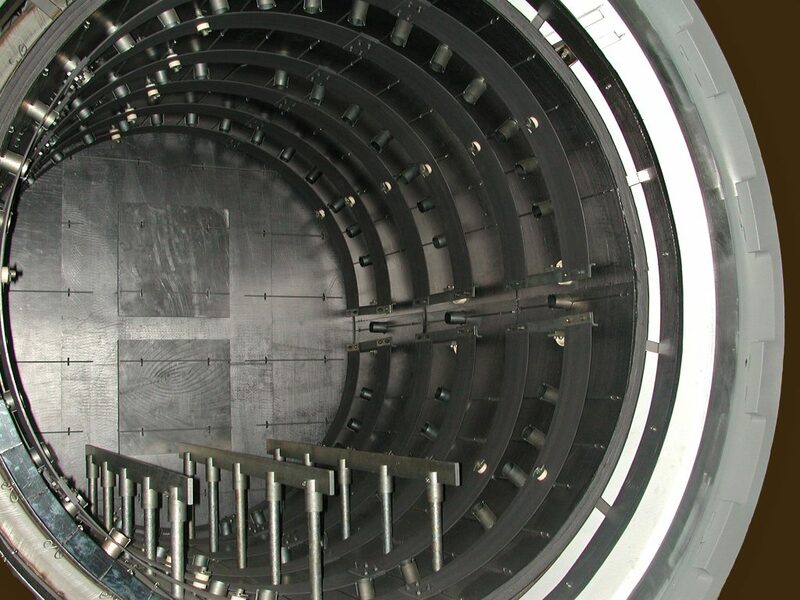 Besides catastrophic damage due to mechanical abuse, eutectic melting or braze alloy spillage, vacuum furnace hot zones will deteriorate over time as a result of the repeated thermal cycling to which they are exposed. The life of a hot zone may vary widely depending on operating conditions. Furnaces that are operated constantly in aggressive environments (eg. sintering) or consistently at temperatures over 1370ºC (2500ºF) may require fairly major hot zone maintenance as often as once per year. Hot zones in furnaces used for standard heat treating operations can be expected to last from 5 to 7 years. The materials used in the construction of the hot zone also affect its service life. For example, stainless steel support structures, rather than mild steel, are more durable. Graphite-based insulation construction, including the use of modern carbon composite materials, usually lasts longer than metal-based construction. Curved graphite heating elements are far more rugged than molybdenum heating elements. With proper training by the furnace manufacturer, patching or replacement of elements can normally be performed by the customer. The more extensive repairs are usually referred back to the furnace manufacturer. Replacement hot zones can range in price from about $30,000 for smaller furnace models to over $75,000 for the larger furnaces. Vac Aero Carbon-Based Hot Zone Utilizing Graphite Elements. Replacement of entire hot zone. VAC AERO’s Furnace Manufacturing Division specializes in hot zone repair or replacement for all major brands of vacuum furnaces. Replacement hot zones can be constructed using the latest manufacturing technology and materials for years of reliable service. VAC AERO offers a choice of pure molybdenum, lanthanted molybdenum, or curved graphite elements in their hot zones. For more information on VAC AERO’s Furnace Manufacturing please click here.